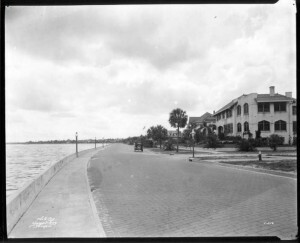 Bayshore Boulevard was an early vision of the founders of Tampa, who wanted to create a roadway along Hillsborough Bay, connecting downtown Tampa with Ballast Point. Developers Alfred Swann and Eugene Holtsinger made this vision happen and succeeded in ensuring that the scenic roadway along the bay was open and accessible to the entire community. To make Bayshore Boulevard a reality, developers sold properties with the foresight to restrict building from occurring along the shoreline from Platt Street to Gandy Boulevard. By the early 1920s, Bayshore Boulevard had become an elegant promenade with a retaining seawall, electric lighting, and the famous sideway. The boulevard that exists today was the result of an ambitious 1930s WPA project. The roadway was widened and medians installed, the entire length was repaved, lushly landscaped, and the iconic balustrades introduced. The sideway – approximately four and one half miles in length – is said to be the longest continuous sidewalk in the world.